Time to get those decorations — and decorating ideas — out of the box. For clever ideas to use in your holiday decorating this year, we sought advice from designing women Linda Giglio, owner of Table of Contents in Raleigh, and independent interior designer Susan Chapman, of Cary. Giglio encourages clients to embrace their own creativity for simple yet sophisticated style. “My goal is to get people away from hurricanes, or three candles with rose petals around them,” she said. A few quick and easy alternatives: “Snow” and red berry branches tucked into a thin clear vase, with a single votive on top. A single large bloom in a glass bowl. White ceramic cubes holding a single red gerbera daisy or poinsettia. Table of Contents’ “recycle-restyle” philosophy means Giglio rents out eclectic containers made of glass, metals, wood and more, and décor pieces from simple to extravagant. That allows clients to stay atop new trends without having to buy, or store, large pieces. Nuts, fruits, corks — use almost anything to fill containers. “I use simple, natural things,” Giglio said, citing supermarket flowers and branches collected on neighborhood walks. Natural pods or cones look great in the base of lanterns, set outdoors or on a staircase. Think ahead, to make sure your décor is long-lasting, Giglio says. “We’re all busy. My home is solace to me, the opposite of this dynamic shop, so I like the dining room table to be done, for something nice to look at. Tablescapes can keep a long time and look good, or your mantel too. That means choosing and creating satisfying pieces that can be tweaked to keep on giving. Chapman agrees. In a nod to her own lifestyle, as mom to two little boys, Chapman thinks “up” in holiday decorating: window décor that blends her love of texture and fabrics. 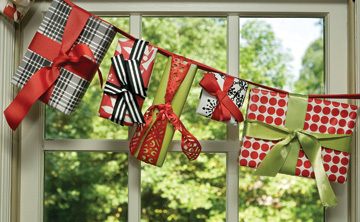 Her winter valances feature gift boxes threaded onto ribbon, and felt mittens hung on a twine line. A favorite fabric also becomes a no-sew tree skirt when wrapped at the tree’s base. Boxes wrapped with pretty ribbons that repeat in the tree offer a merry, budget-friendly look. Like Giglio, Chapman invests in looks that transition. For example, a simple fall base works for months, with add-ins for specific holidays. Post-Christmas, bare branches make beautiful winter décor, wrapped in white lights and set in pots of pine cones and nuts. Whatever the season, designing fundamentals are color, scale and balance, Chapman says. “Have a plan: Pick a palette, colors you’ll like for a while — it can take years to build your collection of what’s comfortable for your home,” she said. Also, think weight: Chapman balances the visual weight of a television on one side of a room with hefty vases opposite. Avoid too-small pieces, and put away what doesn’t work. “Sometimes less is more,” she said. “It’s better to have a couple of larger items than a lot of same sizes, or group the same together. “Rethink it — if your stuff seems blah, try putting pieces somewhere different and play around with them.” Or, host a decorating party with girlfriends, to swap ideas or decorations. “If you can buy just a few new things this year, add a dining room arrangement in a nice scale; that’s one of first rooms people see,” Chapman said. “Or decorate your front entrance, with just a single wreath. Chapman wires a small wreath inside a larger one for fullness, adding textural depth: ferns, berries, even an elf, all in varying shades of a three-color theme. “Different textures within the same color family bring impact,” she said. Whatever your colors or style, enjoy your home.